While many boat owners made the difficult decision to consider their boat totaled by the damage sustained in last fall’s Superstorm Sandy, one owner moved quickly to repair his 52-foot racer. Resting on stands in a boatyard in Mamaroneck, NY when Sandy’s winds reached 100 mph broadside and the tidal surge rose nearly six feet under the boat, she floated off and eventually laid over. Her hull structure failed at the keel bolts, the rudder was damaged beyond repair and water filled the interior to deck level on the port side. Fortunately, a fellow yacht club member suggested the owner consider having the boat repaired by Brewer Yacht Yard Group at their Pilots Point facility in Westbrook CT, where his J/122 had received a similar repair the year before. Within days, the owner exchanged calls, emails and photos with Pilots Point General Manager Jeremy Maxwell, Steve Burke of Burke Design, LLC of Centerville, MA, and his insurance company. All agreed it was a major job, requiring shipbuilding capabilities in addition to more standard boatyard repairs. These would include turning the boat upside down, thermal imaging to determine the extent of damage, and resin infusion to produce the 5-foot by 12-foot section of the hull damaged when the keel separated from it. While the insurance company was slow to get a surveyor to the boat in the chaos after the storm, the owner did receive approval via email to move the vessel from New York to Brewer Pilots Point and to proceed with repairs. By December, the boat was at Pilots Point and work began with the goal of racing her in the Block Island Race on Memorial Day weekend. 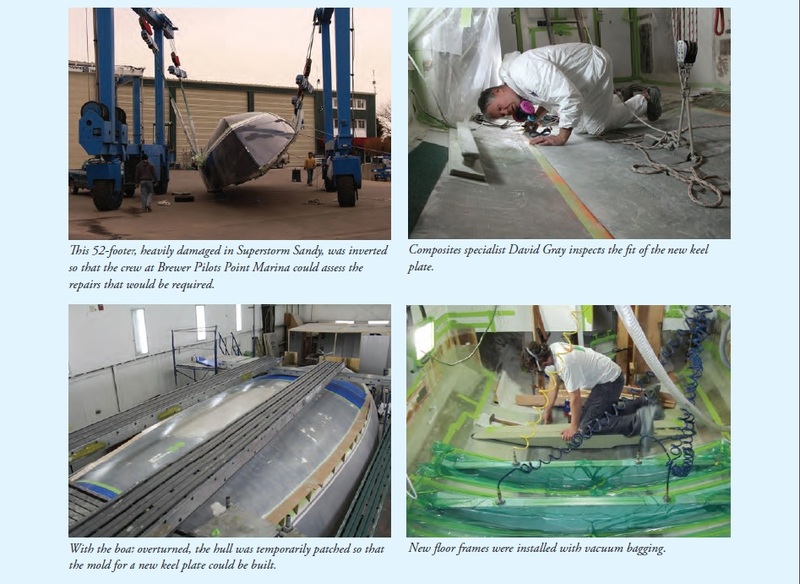 Under the project management of David Gray, Pilots Point’s composites specialist, much of the boat’s interior was cleared away due to saltwater intrusion and to allow access for the repairs. Some parts were beyond salvage, but others were stored for reinstallation. The galley, nav station, fuel tanks, bottom bunks, lower half of the main bulkhead, heads and plumbing were removed, along with the cabin sole and frames. Mark Ashton of Independent Marine Systems, LLC of Newport, RI used thermal imaging to determine the extent of damage and the outside was sanded back to remove all material in order to establish index lines, centerline and level because there was no keel stub. A laser was used to determine those lines once the boat was leveled. The boat was then rolled over in the Travelift to determine the size and location of the hull piece to be replaced and make a mold for the new one. At the same time, saddles were built to cradle the boat once she was righted again. This was to protect her from sagging or twisting once the 5- by 12-foot section was removed. The new piece, called a keel plate, was engineered by Steve Burke to ensure it met contemporary American Bureau of Shipping fin keel strength standards, which are much stronger than the original. The keel plate was created using resin infusion on location at Brewer Pilots Point. This process of making fiberglass produces maximum strength at minimum weight, and offers high repeatability for consistency and saturation of the resin within the fiberglass. It’s a complex and precise system requiring technical experience and high quality manufacturing standards. Collaborating with Burke on the engineering, Gray and the team of technicians laid up the clear gel coat and layers of fiberglass in the mold, taped out the solid piece for the keel sump, then added the core, inner skin and reinforcement before introducing resin. Resin was infused at a controlled temperature using vacuum bag technology to eliminate air pockets in the laminates. The infused structure was then baked for several hours. Thermal imaging was used to confirm the absence of air bubbles in the new keel plate, and it was taken out of the mold to be prepped for installation. At this point, the edges of the hull where the section had been cut out were beveled according to Burke’s drawings and tabbing was added around the joint area. The hull laminate and the new piece were each ground out in a 16-inch taper at the meeting point. This connection allowed for fiberglass bonding that would spread the load and was located in the lowest stress point of the boat, away from the keel. With the new piece in position, the joint was laminated from the inside, and new floor frames and a new mast step were fabricated in place. The boat was rolled again to an upside-down position and the joint was laminated from the exterior. The intact hull was sanded and faired while upside down and even received a coat of bottom paint before being baked again for 12 hours as part of the post-curing process. Then it was time to roll the boat upright again to drill for keel bolts and replace the flooring, main bulkhead, galley, nav station, chain plates, bunks and other items that had been removed or needed to be replaced. The boat was lifted onto the keel, and the use of a laser confirmed it was aligned correctly. The keel and hull were faired and painted. A new rudder was built by Eric Goetz Marine using CAD files from the original designer Bob Smith, and CDC tools to machine the shape. The original 4-inch carbon fiber rudder shaft was not damaged, and was re-used by Eric. The rudder was mounted, the interior was reinstalled, and engine work and other repairs were completed. Once the hull repairs were completed, it was time to step the mast and check the rigging. The mast had been thermal imaged to determine there was no damage, and a new forestay and carbon backstay were installed. In total, the project required 3,000 man-hours. While the boat was not ready until June, the owner says it was well worth the time and effort. His racing machine is a classic design, and one he had invested in personally building from a bare hull and deck in the 1990s. 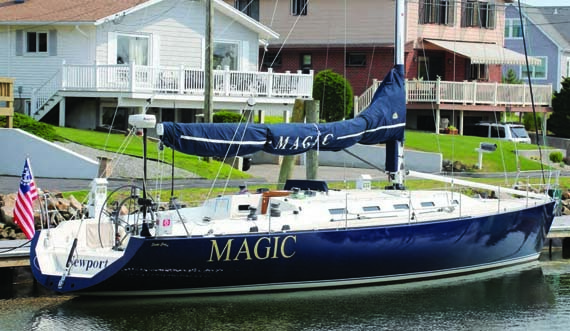 He knew he wanted to repair her after Sandy struck, and he says that she is stronger, stiffer and faster today thanks to the use of resin infusion technology and the strengthening of the keel plate. He suggests that boat owners have a good insurance policy and think hard about how they would react if faced with a catastrophic loss. Such a repair process is a commitment, but one made easier by professionals such as Steve Burke and the crews at Brewer Yacht Yards. His advice to those who find themselves in a similar situation is to talk with other boat owners and do your research to find satisfied customers. And with that, he was ready to start practicing for the Vineyard Race.